Funny how something that once looked fresh and modern, then oh so dated and old, can in time start to look fresh and modern again. Such is the case with that great retro color combination of avocado green and harvest gold from the 1960's and '70's! I'm sure I'm not the only ones with fond memories of growing up with this color scheme. 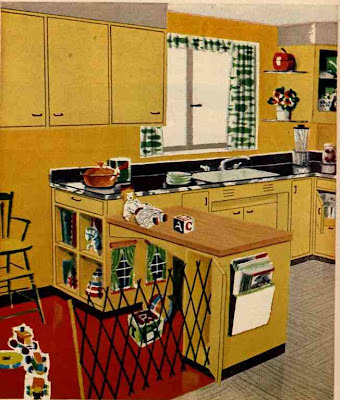 As a kid in the 1970's, the appliances in our house were indeed avocado green, and the wall to wall carpet was harvest gold! 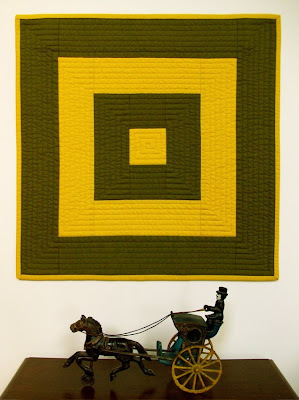 So if your craving some retro color love, my newest Mod Square Functional Art Quilt in Avocado and Gold is now available in my Silly Boodilly shop. 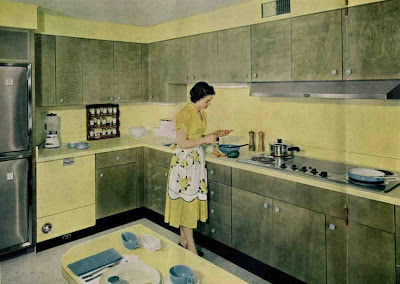 And below for your viewing pleasure are some wonderful avocado and gold retro kitchen images! 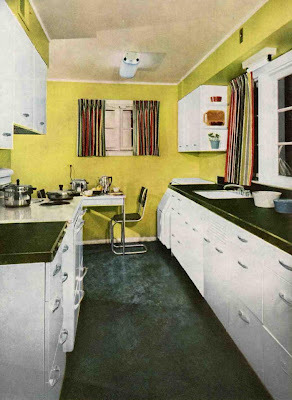 You can see more of these great retro images at Retro Renovation. I Love it! And I love it very much for the reason of fond memories of my dad having avocado green and gold wallpaper in his kitchen. He still does! I'm sure it looked groovy back in the 70s, but then was very daggy for a couple of decades and is now cool again! Maybe he knew it would come back in style eventually! He also has his original 70s avocado green dial phone proudly displayed on the kitchen bench as well. He has at least updated to a more modern phone, but I suspect he still plugs the old one in while nobody is looking! Next time I'm visiting dad I'll take a photo of his kitchen and send it to you. I think you'd get a kick out of it! As he would get a kick out of your gorgeous art quilt. If only he knew how to turn a computer on. Sigh. Super new quilt and thanks for sharing those old kitchen pics. What fun! Our 70’s colours were brown and orange mostly. We even painted our (wooden) TV orange, we had brown walls with wallpaper made of jute and cork floors! I can’t remember the avocado and gold combo. Hey H. Your Dad sounds like a very cool guy! Would love to see a photo of his kitchen! And yes your avatar and Chrisy's do look splendid together! Nicolette, brown and orange were the other big color combo of that time. I believe the Brady's (of Brady Bunch TV fame) had a brown and orange kitchen! Your childhood home sounds downright groovy! 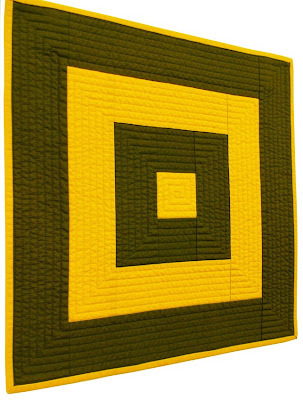 Very cool quilt- these make such a bold statement. I love the images you dug up, too. Loving the "baby zone". A much prettier combination and shades than the avocado, harvest, and orange my mom decorated with in the late 60s early 70s. Love the simplicity. Oh how I remember that avocado green fridge! The colors do look wonderful though. V, This would have looked great in the kitchen of our first house. The kitchen was the first room we redid. Come to think of it, we ridid that whole house. Of course, that was before I had kids, back when I had both time and money. 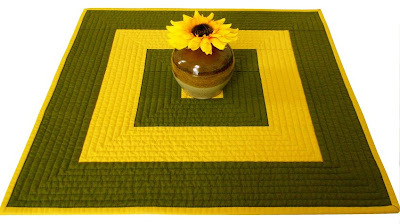 Happy quilting, my friend! Oh, I love this. It does look so fresh, who would have thought. I did not grow up with an avocado and gold kitchen but our living room had a crushed velvet gold couch and avocado green shag carpet. Oh, what a scary thought. Love the quilt; the photos made me shiver! I remember the harvest gold wallpaper with lines of glittery gold all mingled in. My mother only recently got rid of the orange and gold shag carpet our house came with. The carpet came with a rake! Stunning! I LOVE the color combo - bit of retro, bit of right now. You did a wonderful job! Great retro color combos!! :) Keep up the great work!! Avacado yumminess! This is such a happy combination. oh my mom was really trendy and so into green and gold...i'm not sure i even want to go there. though you can make even those colors look great! oooh I would love to see what you come up with for the handwriting tag, I am still in love with the piece you did of the kitchen utensils and ingredients. You had avocado appliances, we had harvest gold! You're right about recycled ideas becoming new and fresh. I wore tunics and bellbottoms when I was playing with Barbie dolls. Who could have guessed they would become trendy again?! My parents had an avacado bath put in in about 1965! 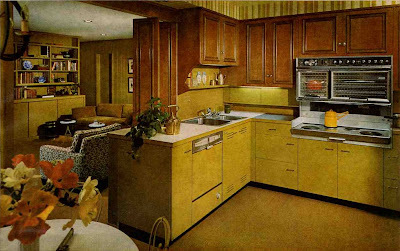 I love 70s colors - these kitchens remind me of my grandfather's house with his orange shag carpet. The quilt looks great! Maybe it would look fresh if I wasn't still living with the original avocado green kitchen appliances and bathroom tiles! Some of us haven't left the 70's yet but thankfully the green shag carpet did get replaced. That was like living with a golf course. Love the quilt. Great use of color. stunning colour combination, I just love these pieces you are creating. I'm still scarred for life by this color combo! My baby bedroom had yellow and avocado green walls (my dad called it 'grass green'. Yes, it was the '70s!) and the carpet was a multi-orange-to-rust shag. The next room was peach walls with bright yellow, green, & orange print fabrics. As soon as I got to choose, I went with blue & white, and it's taken years for me to even come close to using warm colors again. I think the key for me is lots of white. My parents had the whole Yellow Mustard theme going...ugh!!!! I always predicted these colors would come back.